The humble washing machine revolutionized the way we all live. Before automatic washing machines came along, clothes were washed by hand in a tub, a tedious and tiring process. Today, the washing machine takes care of all of the hard work for us, even if it is a less-than-thrilling machine. But the next generation of washing machines is on the way. What will it bring? These concepts offer some of the best, strangest and most ambitious guesses for the future of our laundry. Laundry might be the last household task anyone would classify as “fun,” but the Swirl concept could make it at least a little less tedious. This clothes washer was meant to be used in areas where water is scarce and electricity isn’t available. The spherical design features a handle that allows the tub to be easily wheeled to a water source. 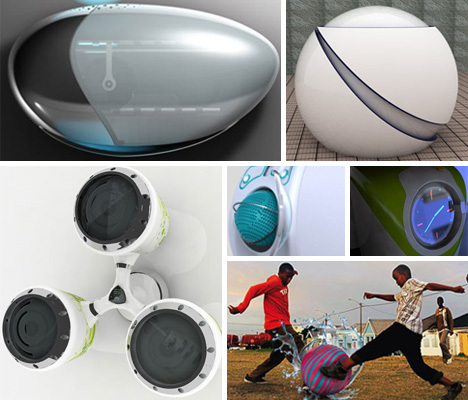 Then, with the handle either still attached or removed, the ball becomes a plaything that users can roll, kick and have fun with to agitate the clothing within. The motion scrubs the clothes clean, no electricity required. And when the tub isn’t being used for laundry, it can be used to transport water for the family. When space is at a premium, taking appliances off of the floor and hanging them on the wall can be a brilliant solution. But in order to do that with an appliance as major as a washing machine, you have to rethink the way the machine works. The Shine concept from the Electrolux Design Team in Porcina, Italy takes into account the fact that most of the world’s population will be living in urban environments by 2050 – a figure that means many of us will be short on space. 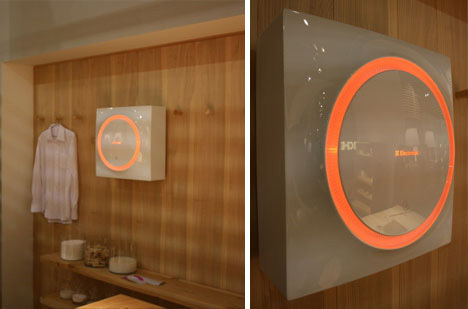 The tiny washing machine can either be mounted on the wall or integrated beneath a bathroom countertop. Lights on the front of the machine count down the time remaining in the cycle while providing unique ambient lighting. It doesn’t get much more futuristic than this concept from designer Jakub Lekes. 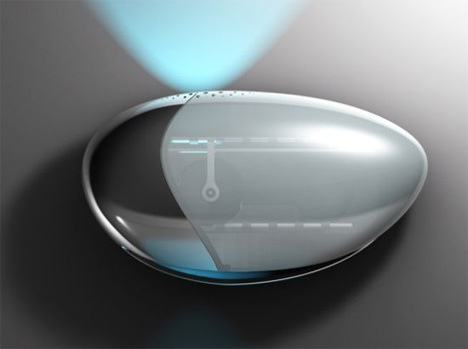 The small, energy-efficient design is notable for its crystal ball-like shape which allows it to spin in all directions. Magnetic levitation, or maglev, holds the ball in place while it spins around, getting clothes cleaner than a circular-spinning drum ever could. 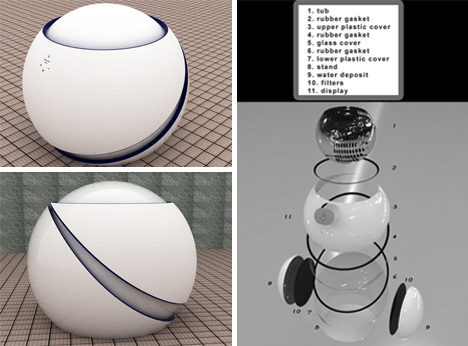 The simple round aesthetic of the Aquarium washing machine concept recalls the unusual shape of the Maglev concept above, but closer to the ground. The interior ball holds the clothing and swirls around in all directions to provide a superior clean while the exterior sits in your home looking like a fascinating piece of futuristic art. If you get a stain on your outfit just before going out for the night, you’d think the best solution would be to change. But why bother when you can simply run your soiled clothes through this wall-mounted wonder and head out of the house with your favorite outfit clean and ready to impress? 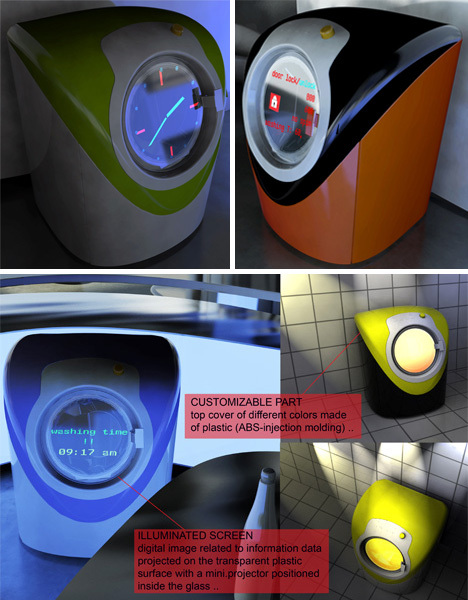 The Pebble is a concept for the year 2022 from designer Ning Ning Lee, and it addresses the age-old problem of washing machine cycles that take way too long. The small appliance washes, steams and dries clothes quickly – and it looks great hanging on the wall. 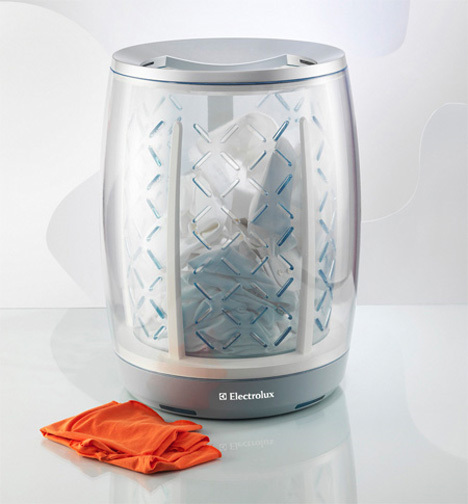 Along the same lines of the Pebble concept is the Electrolux Renew. It’s a quick and easy way to clean and refresh your clothes with a blast of steam – but it can also teach you a thing or two. The Renew uses RFID and infrared scanners to give you information about the fabric composition and condition of your clothes. The machine is equipped with wi-fi and features an OLED touchscreen interface to make navigation simple. Traditional washing machines use a huge amount of electricity and water. 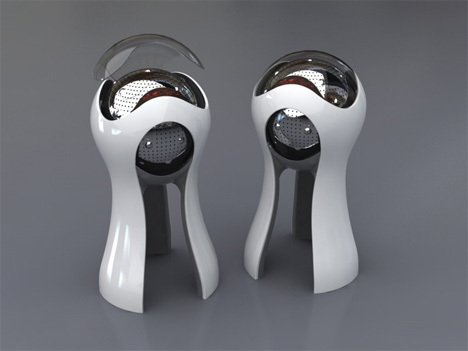 The Orbital concept from Tiffany Roddis cuts down on both and gives the user a simple way to rein in their laundry piles. 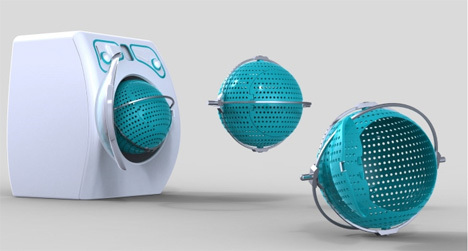 The spherical drum detaches from the main unit to be used as a laundry basket elsewhere in the house, then slots back into the machine easily. The dual axis rotation makes for super-clean clothes, and using the drum as a laundry basket helps users make sure that they are washing full loads rather than energy-wasting partial loads. This Electrolux concept product assumes that most of us hate carrying around heavy baskets full of laundry – which is probably a safe assumption. The iBasket looks just like a laundry hamper, but it’s also a cleverly concealed little washing machine. Sensors tell the machine when it’s full of laundry and automatically starts the wash and dry cycles. 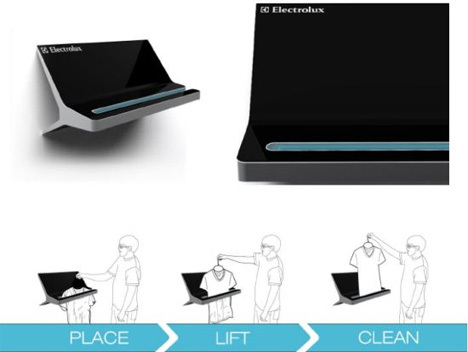 The device is even equipped with wi-fi so you can start and stop its actions from your computer or mobile device. Presumably, the iBasket would be inexpensive enough to keep several in the house; otherwise it would be pointless for families or large households. 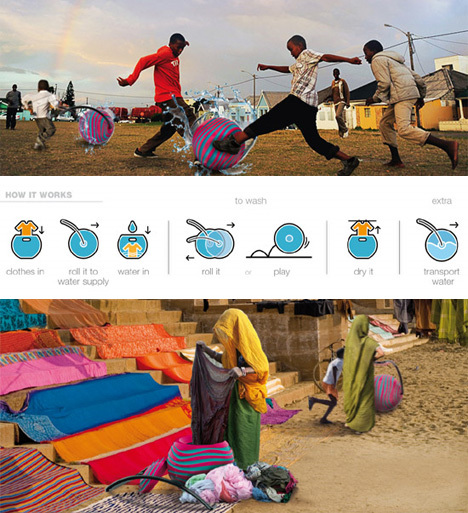 Designers Fernanda Villanueva and Arturo Ariño were inspired not only by the appearance of the “recycle” symbol, but by the meaning of “reduce, reuse, recycle.” Their concept, the Re-Cycle Laundry Center, features three separate and independent pods that all work to keep you in clean threads. One pod is a washing machine, another is a dryer, and the third is a water tank/filtration unit. Water flows from the tank to the washing machine to clean clothes, then back through a filter and into the tank to be cleaned and used again. 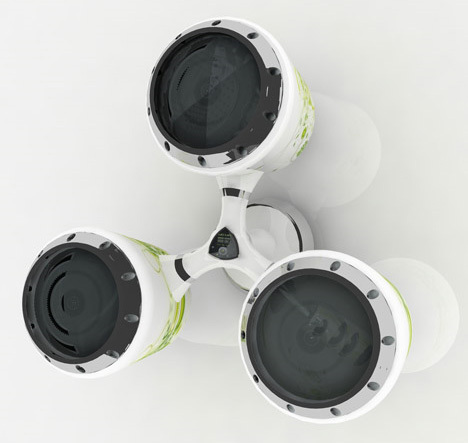 The OVO concept from Murat Ozveri isn’t so much about functional innovation as aesthetic improvement. The machine functions just like a regular washing machine, but it’s so much prettier. Interchangeable face plates allow for simple changes to the color, while a built-in projector shows the progress of the cycle on the door. And when there’s no cycle in progress, the design changes to a handy clock. This is one washer you wouldn’t be ashamed to display prominently in your house.